Sometimes a small shift in perspective can make a big difference. Such was the case when Pulp+Wire was hired to help Portland Downtown design its new corporate logo. The local non-profit agency is committed to building, promoting and maintaining Portland, Maine’s downtown region as a clean, safe, and vibrant destination for businesses, residents and tourists (Portland Downtown is a separate entity that is not a part of the city of Portland). The new logo was the developed over three months time while working closely with the exceptionally talented and visionary downtown district board. Both our team and the board sought to create a clean, iconic brand that also paid homage to early commerce. Our stylistic goal was to design a thoroughly modern icon with a historic feel. After multiple rounds, potential tag-lines and directives, the board honed in on a clean, type-driven logo that honored the past while pointing to the future. The “Portland” type in the logo harkens back to the ghosted typography one can still find on some of Portland’s historic buildings today. The font was created to mimic our city’s classic and bold style. An upward arch mirrors the sloping hills of downtown that rise towards Munjoy hill. The secondary carrying elements ground the Portland type face and accentuate the most important aspect of the icon: the Downtown. All logo elements are designed to highlight the Portland Downtown Region (a small, mapped area within the city of Portland proper) where commerce and community were first established and still thrive today. When discussing taglines, dates and decorative elements, Portland Downtown’s board referenced William Willis’ definitive book, The History of Portland. This resource puts city father George Cleeve’s move to the Portland peninsula between “the latter part of 1632 or the very first of the following year.” Though many sources cite the former as the date of the city of Portland’s establishment, the very nature of that event inspired Portland Downtown to reflect on the difference between the identity of a city and its downtown district. 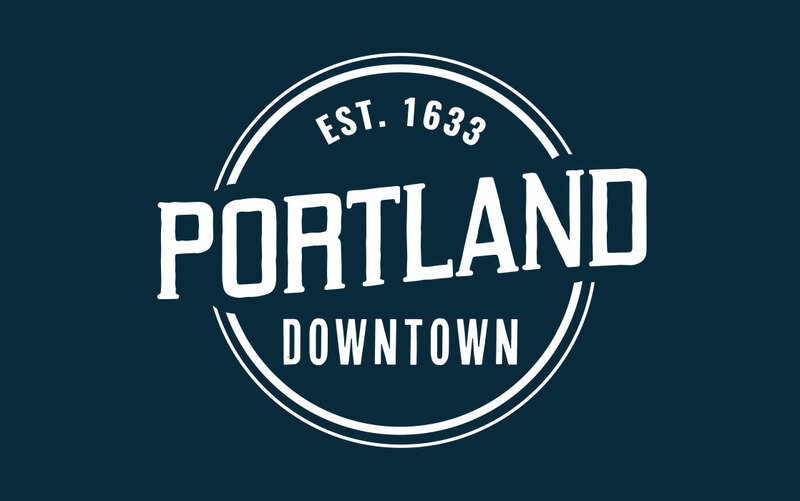 Portland was established in 1632 (as recorded throughout the City) however, commerce (and the vibrancy it inspired) came to fruition in the following years to create the downtown district. That fact made 1633 the logical choice to use as the date for the downtown region’s inception. It was, as Portland Downtown put it, this “economic activity, vibrancy, and the want to gather and grow” that created the heart of our city. In the end, Portland Downtown’s determination to dig deep into the historical record granted much more than a deeper knowledge of the district it’s named for. That exploration inspired new insights into the spark that first gave birth to downtown Portland and the agency’s desire to champion that same spirit today. History must always be judged, of course, in context. Thus the creation of a visual timeline that places Portland Downtown’s chosen date for the downtown district’s establishment within the chain of events surrounding it. That resource serves as a reminder that whatever milestone is chosen to mark the birth of an entire city or its downtown district, that date is simply a marker in the continuing evolution that captures the real story of our very vibrant town. A place for new ideas, business insights, interviews, branding updates and packaging inspiration. Articles and updates are written by the P+W team and may range form insightful to crass— Just like us.